- Mix the feta, goat, and farmers cheeses (I use 2:1:1 ratios, so as much feta as the other two combined). - Mix in the chopped dill. 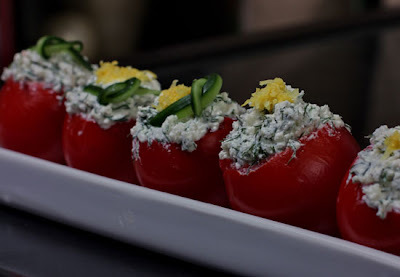 - Carve the interior of some cherry tomatoes with a knife, and fill with the cheese mixture. - Cluster the tomatoes together on a larger bowl, such that the cheese mixture faces up. - For extra color, sprinkle some orange peel on top. - We also used thin slices of cucumber skin to add some extra twists to the presentation.